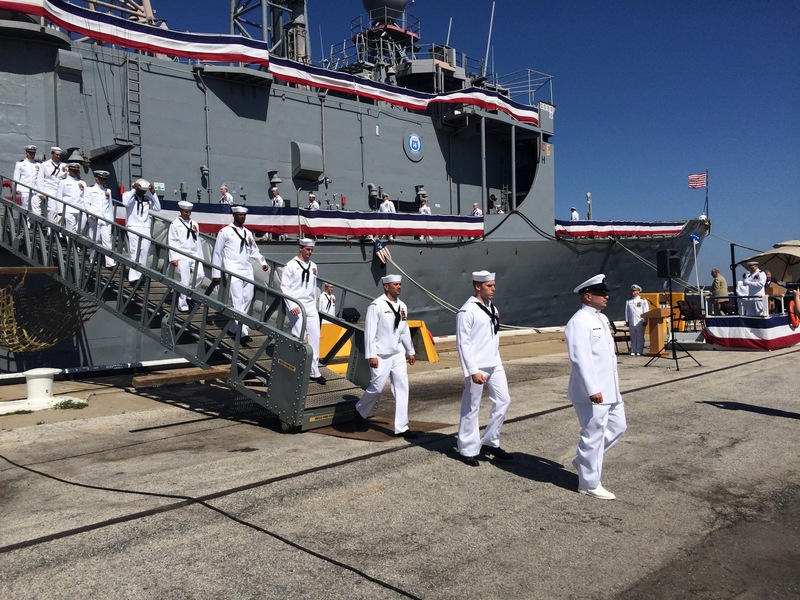 The crew of USS Samuel B. Roberts leaves their ship for the last time on May 22, 2015. It’s been a very Sammy B Memorial Day weekend. The third USS Samuel B. Roberts (FFG 58) was decommissioned on Friday, accompanied by the typical pomp and circumstance the Navy affords its ships on the day they leave active service. Update: Op-ed: On May 27, Navy Times published my op-ed laying out the case for naming a fourth ship after the World War II coxswain. Photo gallery: My best photos from the decommissioning ceremony, wrapped up in a Storify. The decommissioning was also covered by WJXT (video) and First Coast News (story). Op-ed: The Naval Institute published my op-ed arguing that FFG 58, now slated for scrapping, should instead be brought to the Washington Navy Yard to replace the aging destroyer Barry as the centerpiece of the Navy’s main museum. Tweetstorm: Defense One gathered up my tweets about the history and legacy of FFG 58 and used it to make a case for naming a fourth U.S. warship after Roberts. Longform: Navy Times’ David Larter tells the story of FFG 58 anew in this longform piece that includes video interviews of former CO Paul Rinn and current crewmen and an audio interview with me. Article: USNI also republished my 2013 Proceedings article about the mining of the Samuel B. Roberts and the crew’s fight to save her from fire and flood. Podcast: Cdr. Salamander rebroadcast a 2013 episode of his Midrats podcast in which we discussed the mining of the Roberts.